Super easy Chicken BLTA Salad with a creamy avocado “Bomb” Sauce. 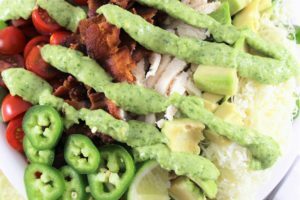 All fresh avocado, jalapenos, cherry tomatoes, spinach with grilled or baked chicken, crispy bacon and freshly grated Monterey jack cheese topped with a homemade creamy avocado sauce on a bed of baby spinach. Perfect salad for a lunch or dinner any day of the week to keep you full and satisfied. The pictures don’t do this salad justice! So delicious. Gather ingredients, knife, cutting board, salad bowl, pan, tongs, and cheese grater. Grill or bake chicken until done. 45 minutes on 350 degrees in the oven. Cut chicken into bite sized pieces once fully cooked. Cook bacon in the pan on a medium heat until crispy, use your tongs to flip bacon often. Chop bacon once fully cooked. 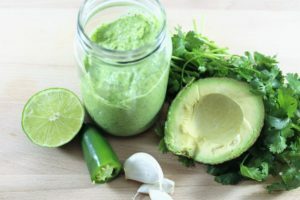 Prepare "Bomb"Sauce for a creamy avocado dressing according to link's directions. Cut 1/2 an avocado into bite size pieces and cut cherry tomatoes in half. 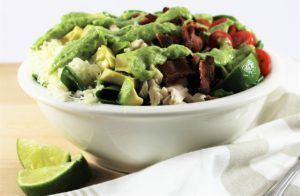 Place 3 cups of baby spinach into salad bowl and assemble chicken, bacon, avocado, cherry tomatoes on top. Use the cheese grater to shred 1/2 cup Monterey Jack cheese. Toss sliced jalapeno on top. Pour the "Bomb"Sauce on in your desired amount. I love BLT and the avocado and chicken just makes it better! Yes please! Loving everything about this…and so would my husband. 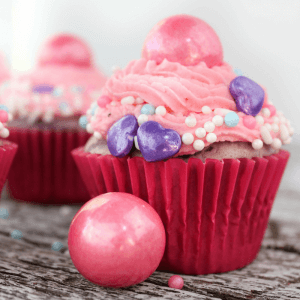 This will be on the menu this weekend! This looks absolutely amazing! Yum! And avocado is so easy to share with baby so it’s a perfect lunch for me! Our baby loves, loves, loves avocado!